Congratulations to the class of 2010 graduates at The College of William and Mary, and most especially to the two members of the class of 2010 from theU.S. Coast Guard Auxiliary Detachment there. The weekend prior, on May 8, five Auxiliarists also graduated from The Citadel. Though I was unable to make south for The Citadel, I was honored to attend ceremonies at William and Mary this past weekend. 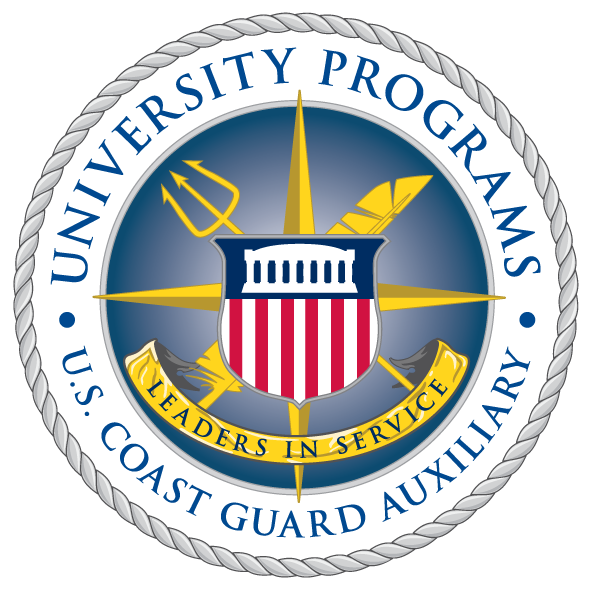 Student members of the Detachment at both schools, as well as the one at Auburn University (which had no graduating seniors this year), complete extensive Coast Guard Auxiliary training in addition to their academic studies. Course topics and practical application immerse students in leadership, boat handling, operations across a variety of mission areas, and the Coast Guard itself. This year's graduates were Alex Wright and David Kraemer. Mr. Kraemer -- a Government and Environmental Policy double major -- concentrated in Marine Safety and Environmental Protection (Prevention), and is notable for having been one of the two student "plank owners" when he and Emily Johnson (class of 2009) were the first to enroll in the new program several years ago. He further distinguished himself through his service as communications services officer in Williamsburg and service as a qualified instructor. Mr. Wright -- a History and Hispanic Studies double major -- concentrated in boat operations and served as the Detachment's student leader during his senior year, when the unit saw a marked increase in students earning operational qualifications under his leadership. He was recognized during the ceremony for having not only completed the course of study, but also for having completed his crew qualification, and passed the Nav Rules exam and Administrative Procedures Course. I want also to recognize the graduates from The Citadel, whom I did not have an opportunity to meet as I was unable to make it for their event. They are Patrick Boyle, John Delago, David Graham, Nick Koenig, and Scott Rajnay. They, like their shipmates from William and Mary, are off to great lives of service in and out of the Coast Guard Auxiliary. The new graduates are pictured in the photo above along with fellow alum Emily Johnson, who returned for the ceremony, myself (far right), and Todd Egnor, the Detachment Leader (officer in charge). Mr. Egnor is one of the finest mariners I know, having accumulated significant sea time training USCG Academy Cadets and Officer Candidates aboard the Coast Guard Cutter Eagle. While he continues to spend summers aboard Eagle, he now spends most of the year working with our student Auxiliarists at William and Mary. He impressed everyone at the ceremony when he spoke of how the first operational mission with an "all Detachment" crew was completed on the James River -- Mr. Egnor served as the Coxswain, while qualified students served as crew. Mr. Egnor and his crew of instructors, along with counterparts Jake Shaw and Bill Riley at Auburn University and The Citadel (respectively) spend countless hours each year working with these students, and they deserve the thanks and respect of our entire service. Ms. Johnson and I attended the event on behalf of the USCG Auxiliary's University Programs Branch, where we currently work not only to support the operations of existing campus-based Detachments, but also to enhance the program and expand on new campuses. To The College of William and Mary, my alma mater, thank you for the opportunity to come home. To the students, instructors, staff, university officials, parents, friends, and most especially the graduates that make this new, yet invaluable program such a success - I thank you for your service.